Note: Customers who purchased Curve4 via the Early Bird promo will have already received their license and can download Curve 4.1 any time. Responding to the number one user request, Curve4 now drives the best instruments including X-Rite's i1Pro, iO, iSis, Barbieri's Spectro LFP, Konica Minolta's new FD-9 and Techkon's SpectroDens (Mac-only initially). X-Rite eXact support will follow soon. (released Sep. 2016) Has a unique visual interface aimed at print buyers and print professionals alike. It quickly summarizes a printing system?s compliance to the newest G7 Master Pass/Fail Requirements, including Grayscale, Targeted and ColorSpace and SCCA. It also provides Pass/Fail testing of production proofs using standard ISO 12647-7 control strips and exports measured data for G7 Master submission. All current ISO 15339 CRPCs are included along with Idealliance's new XCMYK characterization data, and Curve4 also loads custom color aims. "Verify Tool is a great leave-behind when G7 implementers are gone." explained Steve Upton, President of CHROMiX, "It's easy for customers to perform quick verifications with references set up beforehand by their G7 Expert." 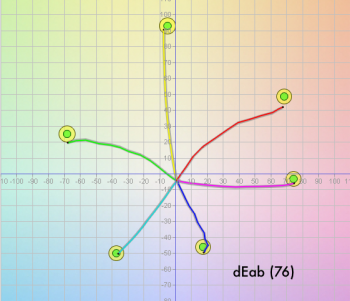 (released today) is the upgrade of the industry's de facto G7 calibration tool, Curve3. New Ink Restriction and predictive color analysis provide pre-calibration that's superior to most RIPs' onboard functions - especially for dye sub and other challenging large format inkjet work. "The new Ink Restrictions mode is a huge asset. ", says Scott Martin of Onsight, an active beta tester, "Not only can it be used to determine the optimal ink restrictions for maximum saturation, but it can also be used to determine a neutral 100% CMY patch"
Experienced G7 implementers will love Curve4's streamlined features including "miniP2P" targets, which are much smaller for fast scanning and fit on smaller printing systems. P2Pless calibration operates with non-P2P targets like the IT8.7/4, and tiny ?reCal targets can fine-tune an existing calibration with only a handful of patches that easily fit on a live job. "Two of the biggest requests from Curve3 users was faster operation and the ability to recalibrate a press without printing a whole P2P target" said HutchColor's Don Hutcheson, creator of G7 and co-author of the G7 Master specification. "Curve4 fulfills that promise." In addition to G7 calibration, Curve4 calibrates Spot Color printing by the new SCTV method from ISO 20654 and by the TVI method to ISO-standard or custom TVI curves - including ISO 2013 curves. "For packaging, the ability to calibrate to the new SCTV standard, combined with its other innovations, puts Curve4 ahead of the industry! SCTV is going to simplify and improve the way we print spot color inks, whether for a brand color or 7-color extended gamut printing." said Steve Smiley of SmileyColor & Associates - recently inducted into the FTA Flexo Hall of Fame. "With built-in measuring, fast G7 Master verification, support for CxF and SCTV and all the other new features, I am just overjoyed with Curve4." Both the Verify and Calibrate tools have greatly-improved full page reports for printing or PDF export. (released today) is a new multi-function toolset for modifying and enhancing measured data. It's a great place for measuring multiple press targets and then averaging and smoothing them together, tuning their white and black points and exporting to a variety of file formats. Black point adaptation improves measurements for profiles of uncoated or matte stock, correcting proof-to-press mismatches that have existed for years. Targets can also be merged to create different patch sets or have smaller subsets extracted. It even recreates missing patches, for example creating a P2P target from an IT8. All tools import CMYK ICC profiles as source data and will directly download multiple production measurements from Maxwell, CHROMiX's online color monitoring service. Blended measurements can be exported or uploaded directly to Maxwell for use as custom color aims. Curve4 manages all files with an easy work list to the left of each tool. Moving between files is fast and they can be organized into client or project folders. CxF and CGATS format measurement files are supported for importing or exporting color data. Curve4 is available in three license levels: Verify, Calibrate and Complete. Curve4 Verify is priced at $399, Calibrate is $1,599 and Complete is $2,999 with upgrades available to each level. A Demo mode is available in the free download. See below for limited-time bundles with great measurement hardware. The measurement tools are inherited from our years of development on Maxwell so they are stable and have some great features. One great feature is the newly-introduced MemoryScan function that stores the position of a target (for iO, LFP and KM FD-9) and quickly scans other targets placed in the same position. For complete Curve4 product and pricing information, go to the Curve4 product pages. Join CHROMiX and HutchColor for a full overview of Curve4. Don Hutcheson and Steve Upton show the new Curve4 interface and functionalities. If you want attend, just simply email us your RSVP Here to be added to the webinar. We'll send you the meeting information. Thanks for your patience (you know who you are). Thanks to past Curve customers who trusted us to purchase a Curve4 Upgrade, in advance! Thanks to new Curve customers who trusted us enough to take the risk of buying Curve4 for the first time, in advance, sight unseen! Thanks to our spectacular group of Curve4 beta testers and their generous time contributions! Thanks to this wonderful and supportive G7 printing market, who appreciates a good, clean piece of G7 calibration software. Thankfully Curve4 is good. Really, really good. September 10th - 14th, 2017 - Print 17, at the McCormick Place, Lakeside Center in Chicago, Illinois. October 10th - 12th, 2017 - 2017 SGIA Expo, New Orleans, LA. Everything specialty graphics. October 25th - 28th, 2017 - PhotoPlus 2017 Conference and Expo, by pdn. Everything photo. In New York City at the JAVITS Convention Center. Version 9.2 has the ability to search for fix-ups, checks, profiles, and, across multiple libraries. Plus there are many smaller features that can be found throughout v9.2. ColorGate is promoting a new high-speed spectrophotometer in a box concept for hard to measure objects. It's fast. Not sure about markets targeted or pricing, but check out the demo video for best understanding. Key new features add Measure Tool, Edit Primaries Tool and Tone Value Tool. Check it out on our ColorGear store website. The True Colors of Dinosaurs: Our friends at Konica Minolta published a short but interesting article about, well, the hypothetical color of dinosaurs. We thought you would enjoy. Men and Women color vision differences study: This article is about how differences in color vision have contributed to gender roles and stereotypes. Thanks again to KM. New G7 Master Certification Levels Explained, again: CHROMiX received a tremendous response from readers about Pat Herold's article in the lastColorNews Issue #60 explaining the new G7 certification levels. This information was news to many people but certainly helpful to most. Here's circling back again to that article by popular consensus. The subject of fake news has been bandied about the news outlets in recent months, and I must confess I feel this issue's article will be accepted as readily as "Two-headed Man Talks in Stereo!" CIELab, or more correctly spelled: CIEL*a*b*, is intended to be a device-independent color-space based on the measurements of 30 some-odd humans, which William David Wright and John Guild did in the late 1920s. The CIE created the CIEXYZ color space in 1931 from these experiments. In 1976 the CIE created the Lab space to reflect the entire gamut or range of colors the human eye can typically see. Lab space, unlike other CIE color spaces, is supposed to be perceptually uniform. That is, any movement within the space, in any direction, should result in an equally perceptible color shift. We in the color industry have spent years teaching the color-going public to respect, accept, and embrace Lab color space as the connection of choice when it comes to communicating color. We have gently reminded press operators that those CMYK values are not really colors, but just numbers that give them certain colors on a certain machine with a certain medium. Use Lab values to qualify colors, press operator! Don't just hand me a Pantone swatch, graphic artist! Read me the Lab values so I know what color you're looking for! Lab numbers are where it's at, man! An early issue of the CHROMiX ColorNews featured an excellent analogy about toasters that pointed the reader to Lab as a great independent space for defining color. Well, a hidden little secret has deviously been kept shrouded from the innocent public, but I'm ready to blow the lid off this conspiracy right now. Lab is warped! It is not quite as perceptually uniform as some would believe. In fact, the human sensation of distances between colors is uneven around the Lab space. It's somewhat twisted and distorted. There have been clues about this reality for years. Some might have noticed in the early years of profile generation software that yellows had a tendency to easily shift green, and blues to purple, reds to orange - but latter updates to the software fixed all that. C'mon - you mean to tell me you never noticed the way the cyan and blue ink ramps would twist a certain way, counter-clockwise? Sure, ink impurities might be responsible for some of that, but a lot of this is due to warped Lab. And then, did you notice we had to develop newer, more accurate ways of calculating delta E? According to colorwiki.com: Delta E is a unit of measure that calculates and quantifies the difference between two colors. A delta E of 1.00 is considered the smallest distance between colors that a human can distinguish by eye. In this day and age, we rarely choose to use delta E ab (also known as delta E 76) in calculating small differences between colors. Delta E 2000 is much more accurate, and is implemented in most software these days. Calculating a single distance between two colors using Delta E 2000 involves 29 different equations! Delta E ab would use just one. All this just to try to un-warp Lab! As unfortunate as this irregularity of Lab is, it's what we have, and we've managed to work with it so far. Here's an analogy that might make it easier to picture the problem and why it is hard to come up with a solution that will just fix it. Imagine laying an even grid of crisscrossed lines onto a map to aid in identifying different locations on the map. Then you find out much later that the map under your grid was slightly wrong, but by then everybody was using that map to find places, it has been copied and distributed world-wide, and it would be very difficult to have everyone start using a corrected map (cough)Mercator(/cough). Lab space is like the grids you laid on the map. Those grids still serve as a very valid means of communicating where on the map to find Pike Place Market - but, the distance between Pike Place Market and the Space Needle might be farther than it looks since the underlying map is slightly skewed. This is similar to the situation we have with Lab space. The even distribution of that grid of Lab values is still a very accurate way to identify colors. It's just that the distance between colors is not as evenly spaced as it appears on the graphs that you see. This whole issue has come front and center with the adoption of deltaE 2000 (dE2000) for G7 calibration verifications. Our own Curve3 software had a 2 dimensional ab grid showing how the ink ramps of a printer would stretch out as more ink was applied. How close they got to the bullseyes at the outer edges of the spider graph would tell how close the printer came to the specification they were aiming for. 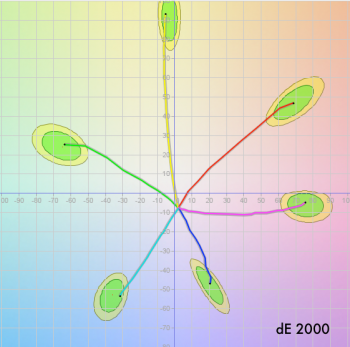 With the adoption of dE2000 in the specification, our Curve4 software shows a similar spider graph, except that now we calculate the aim points and the tolerance variations more correctly -using dE2000. All of a sudden these are not small circles but large ovals (ellipsoids), stretched and misshapen in various directions. They are more like lily-pads than bullseyes and the natural inclination is to think that this new graph is somehow wrong. (Why are they so big?) Actually, these ovals are faithfully representing the variation that is allowable according to the spec using dE2000. Taking a look at the shapes of the lily pads in the new spider graph gives you an idea of how Lab is warped. The yellows and blues, for example, are long and narrow as they expand out from the neutral axis. This shows that, for these colors, it takes a greater difference in chroma (saturation) in order to affect a similar difference in hue perception - compared to what you would expect just looking at their relationship in a Lab grid. There you go. The secret's out. If this issue of the newsletter becomes popular with our readers, I might come out with a future revelation about how Chris Pratt is really a color management technician in Seattle. Nah just joking. One place where you can always depend on getting real news and useful information about color is from the CHROMiX ColorNews. Entire Contents of CHROMiX ColorNews (c)2017 CHROMiX, Inc. CHROMiX, Maxwell, ColorThink, ColorNews, ColorSmarts, ColorGear, ColorForums, DisplayWatch and ProfileCentral.com are trademarks of CHROMiX Inc. All other trademarks are property of their respective owners. CHROMiX ColorNews is intended as an informative update to CHROMiX customers and business associates. We are not responsible for errors or omissions. You may not copy or reuse any content from this newsletter without written permission from CHROMiX, Inc.